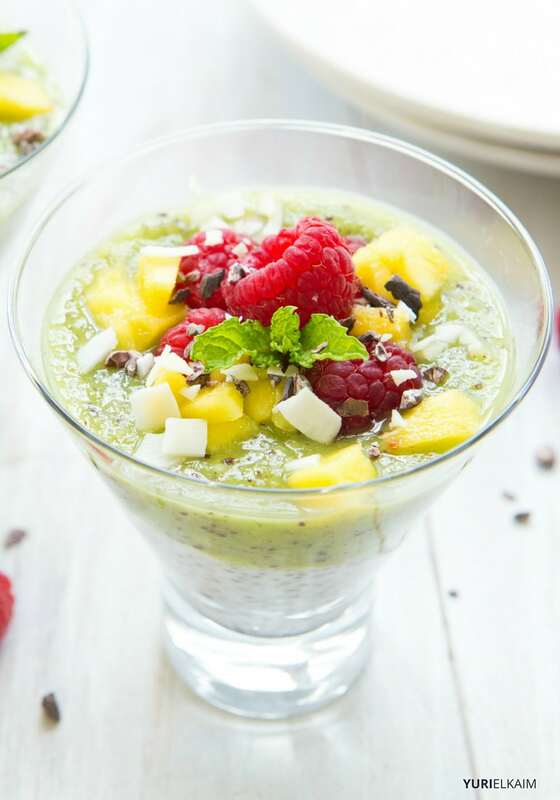 Whether you need an energizing wake-up breakfast or you’ve just finished a workout, reach for this tropical chia pudding parfait. Tart and sweet fruit blended with toasted coconut is a combination that tastes just like paradise. Add in chia seeds, and you’ve got a phenomenal snack or meal. The ancient Incas, Mayans and Aztecs used chia seeds for sustainable energy when traveling on foot. This makes sense since chia seeds are not only packed with essential vitamins, minerals, and protein, they also contain eleven grams of fiber to keep you full for hours and help regulate blood sugar levels. Chia seeds make an excellent vegan option for supplying calcium, so add them to meals whenever possible. Coconut milk adds a mellow, tropical flavor to the tart and sweet fruit in this parfait. Coconut milk is rich in lauric acid, which has many germ-fighting and anti-viral properties that are excellent at ridding the body of viruses and bacteria. Even if you’re not vegan, swap out dairy for this great tasting healthy alternative. Finally, the kiwi, mango, and raspberries give you a good dose of vitamin C. Vitamin C plays a role in iron absorption, which is key for energy and vitality. When you’re hankering for a sugary breakfast cereal or snack bar, try this delicious tropical parfait instead. Take notice of how well it makes you feel, because wholesome food is what your body really needs. This no-blender smoothie is a delicious way to enjoy a "chewable" smoothie. Great for breakfast, lunch, or to enjoy as a healthy snack. Combine coconut milk, chia seeds, honey, salt and vanilla in medium-sized bowl. Cover and refrigerate for at least four hours. When ready to serve, blend the frozen kiwi in a blender, taking care to not over-blend and break up all the seeds. 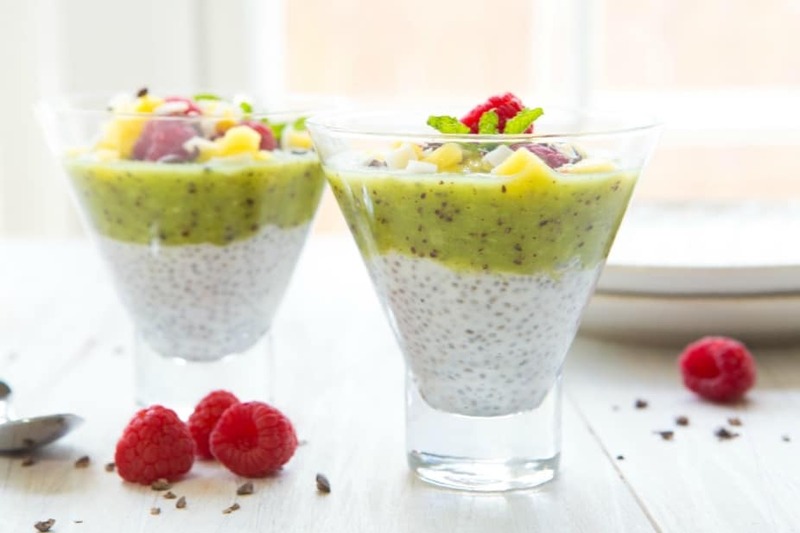 Spoon the chia pudding into a parfait glass. Pour the frozen kiwi puree on top of pudding. 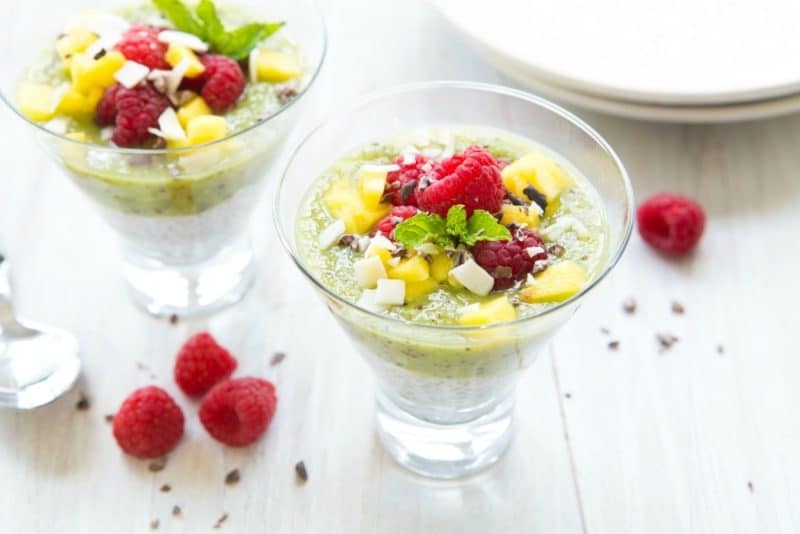 Top with mango, raspberries, coconut, and cacao nibs. Enjoy!